Welcome to The College of Westchester Library! 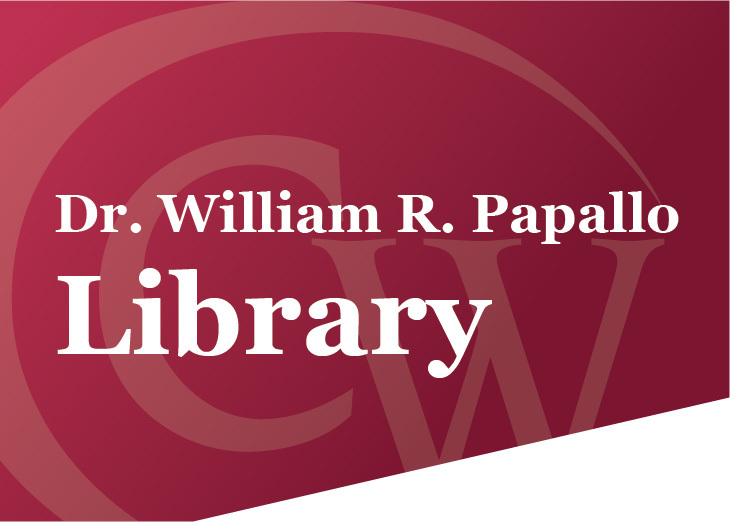 The CW Library provides services and collections in support of research and learning. We offer a comfortable learning environment where students are surrounded by a range of publications, books, magazines, newspapers and other resources. The Library also provides access to online academic databases that focus on a variety of subjects where students can search for scholarly articles (and more). We look forward to offering our assistance and working with you throughout your academic career at The College of Westchester! This sample paper is formatted in the APA (American Psychological Association) Citation Style. This sample paper is formatted in the MLA (Modern Language Association) Citation Style. Sample citations for financial reports, corporate websites, etc. Sample citations according to the 6th edition APA Manual. - There are a few ways you can contact the Library. You can email us at Lib-Online@cw.edu. All librarians will receive your email and get back to you within a timely manner. You can also contact the Library by calling us at 914-831-0280. - You can search for a book by using the links above. For more on how to search for books, please view the Library Catalog Tutorial. How do I borrow materials, for how long, and how many? - As long as you have The College of Westchester ID you can borrow a book. All you have to do is inform one of the librarians and they will check the materials out to you. You can borrow materials for two weeks, however, you are able to renew them if you choose to. Renewals can only be done by librarians. Students can take out as many books as they like but there is a two DVD limit. - The College of Westchester ID is taken in the library. You will need your schedule that has your student ID number on it (this can be obtained in the Academic Center). It will take approximately five minutes to create. - Yes, the library has a wide variety of eBooks. Click on the “Databases by Subject” link above and choose “eBooks” as your subject ( or http://library.cw.edu/ebook.html). Both Books 24x7 and Ebsco eBooks will provide you with an ample amount of information. Is there anything I can’t check out? - Students cannot check out reference materials and periodicals (magazines and newspapers). You are welcome to read them while you are in the library but they cannot go outside the library. - Yes, WIFI is available in the library. One of the librarians will assist you in connecting to the network. - There is no cost to print in the library. I need to do a research paper but I don’t know where to start. Who can I ask for help? - You can come into the library and ask any librarian at the library. You can also email us at Lib-Online@cw.edu or call us at 914-831-0280.